Frog Rock is a lovely and frog-like rock which is located at the sea side near Xiao Wan. The rock faces toward the sea, sitting on the grass. Or it’s more appropriate to describe it as hiding inside the grass. The frog seems pondering over something. Perhaps, it’s waiting for a prey to catch instantly or expecting a playmate to jump into the sea for fun. Frog Rock is about 60 meters high. Seeing from the Sea Watching Building in KenTing National Forest Recreation Area, the back view of Frog Rock seems extremely like a frog that is ready to jump into the sea. Especially the outline of eyes, it’s almost 100 % the same. Frog Rock and DaGien Hill are both external rocks brought by KenTing argillite. The rocks are wrapped inside the argillite. Since rocks are harder than argillite, they gradually expose and become independent rocks by erosion of wind and sea water over a long period of time. 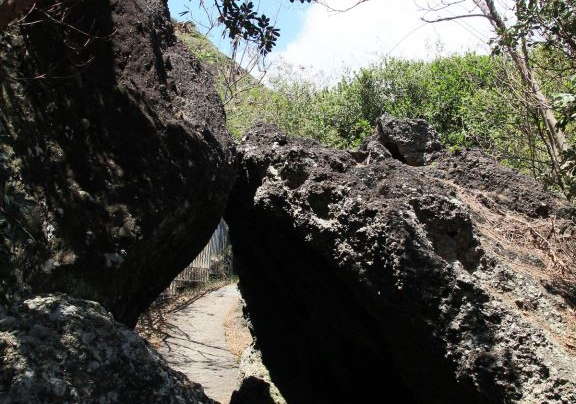 Inside KenTing Youth Activity Center, there is a seaside Frog Rock trail. Along the trail to the shore, you can often see large rocks standing on both sides. These rocks are igneous rocks which are formed after lavas are cooled to solidify. Close to seaside, rocks are coral limestone which is common in KenTing. Everywhere is special landscape formed by long term sea water erosion, for example, sea notch and honeycomb rock. In addition, the ecology of plants and animals here are abundant. The most common tropical costal plants at Frog Rock seaside are Taiwan date palm and Indiapoon beautyleaf. Taiwan date palms are mainly distributed in lowlands and seaside. Since it is edible and ornamental, it is easy to be damaged. Indiapoon beautyleaf is a plant that easily multiplies, which also often attracts Taiwan bulbuls to nest on. Therefore, when you hear bird singing at Frog Rock, undoubtedly, it is Taiwan bulbuls saying hello happily.